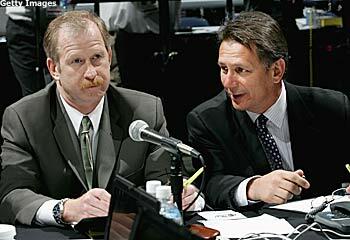 Jim Nill, Ken Holland and the Detroit Red Wings are the best example of how important drafting is to an organization by winning the 2007-08 Stanley Cup with only one first-round draft pick on their roster. OTTAWA -- It's been three years since NHL general managers gathered in Ottawa for the Entry Draft. The last time they did, Pittsburgh went home with Sidney Crosby; the other 29 went home jealous. All 30 teams would love to be as fortunate as the Penguins were then, though that's not likely to happen. Finding the next Crosby is easier said than done. Since what is now the Entry Draft was first held in 1963 (Montreal took Garry Monahan with the first pick), success in picking the next generation of NHL talent has been a hit-or-miss proposition. But the rewards are high. Both of this year's Stanley Cup finalists, the Detroit Red Wings and the Penguins, are examples of the benefits of good drafting. The Penguins have had it easier — Crosby, Evgeni Malkin, Jordan Staal and Marc-Andre Fleury were all picked first or second overall, while the Wings were loaded with their own draft picks, but had only one first-rounder (deadline day acquisition Brad Stuart) on their roster. Going back further, dynasties like the 1970s Montreal Canadiens and 1980s New York Islanders and Edmonton Oilers were built on the foundation of brilliant drafts. Where the boys are — Canada is still the biggest provider of NHL talent, though not nearly to the extent it used to be. Of the 4,456 players drafted since 1991, 2,061 (46.3 percent) were born in Canada (the United States is next with 848). But from 1991 through 1998, more than half the picks each year were Canadian; since 1999, Canadians have represented less than half the draft class. Last year, 102 of 211 players selected (48.3 percent) were Canadian. The Ontario Hockey League has been the biggest single supplier of talent. Since 1969, 1,893 OHL players have been drafted — 21.2 percent of all players drafted. The Western League is next with 1,651 (18.5 percent); the Quebec Major Junior Hockey League is a distant third with 925 (10.4 percent). The Western League was tops last year with 37 players chosen, the Ontario League was next with 35, and the Quebec League had 25. Looking everywhere — Since 1969, 1,767 international players have been drafted — nearly one out of every five chosen (19.8 percent). The percentage of international bounced around in the teens in the 1980s, climbed into the 20s in the 1990s, and soared as high as 41.2 percent (119 of 289) in 2001. After that, the numbers began going down — and last year's total of 36 (17.0 percent) was the lowest since 1989, when only 38 non-North Americans (15.1 percent) were chosen. The number of Russians taken in the Draft has plummeted over the past few years, with only eight taken in 2007, down from a high of 47 in 1992 and less than 25 percent as many as the 33 taken as recently as 2002. There have still been more Russians taken since 1991 than any other non-North American nation — 440, well ahead of Sweden, which is next with 277. In all, 28 countries outside North America have had at least one player taken. New kids on the block — One out of every 10 players selected last year (21 of 211) was taken from a United States Hockey League team. That's a record for the USHL, which had its first player selected in 2000 and had between nine and 14 players chosen in each year until 2007. Three of last year's picks — Max Pacioretty (Montreal), Patrick White (Vancouver) and Nicholas Petrecki (San Jose) — were first-rounders. Two for No. 2 — No brother combination has ever been picked No. 1 overall, but two brothers have been selected with the No. 2 pick. Pittsburgh took Jordan Staal second overall in 2006, three years after Carolina took older brother Eric with the No. 2 pick. There have been three Staals picked in the first round — Mark, was taken with the 12th pick by the New York Rangers in 2005. The Staals are only the second brother combination to have more than one brother taken in the first round. The other combination was the Sutters; four of the six Sutter brothers to play in the NHL were chosen in the first round. Duane and Brent were both chosen No. 17 by the New York Islanders; Duane in 1979, Brent a year later. Rich and Ron Sutter are one of six sets of twins to be drafted in the first round (1982); they and the Sedins, Henrik and Daniel (1999), are the only ones taken in the first round. Dryden, drafted by the Bruins in 1964, is the first draft pick to make the Hall of Fame. Firsts And Lasts — Ken Dryden is the first player taken in the Draft to make the Hockey Hall of Fame. Unfortunately for the Boston Bruins, who picked Dryden in 1964, he opted to go to Cornell and they traded him to Montreal. Dryden eventually turned pro and led Montreal to a memorable upset of the defending champion Bruins in 1971 on the way to the first of his six Stanley Cups. Detroit defenseman Jonathan Eriksson, selected 291st in the 2002 Entry Draft, became the highest-drafted player to score a regular-season goal when he got one against Edmonton on Feb. 26. He passed forward Simon Gamache, picked 290th overall by Atlanta in 2000. Gamache is 6-7-13 in 48 NHL games with four teams, including 2-2-4 in 11 games with Toronto in 2007-08. Goaltender Brent Krahn, selected by Calgary with the ninth overall pick in 2000, is the most recent player (23 and over) to be a top-10 pick and not play in the NHL. Krahn, now 25, has been plagued by injuries and is still in the Flames' farm system. Highs And Lows — Beginning in 1968, every player taken No. 1 overall has played at least 299 games in the NHL — before that, three of the five top picks never made it. 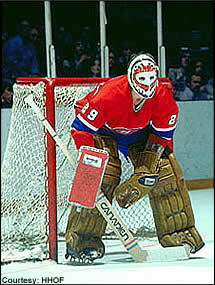 Gord Kluzak, taken first by Boston in 1982, and goaltender Michel Plasse, selected by Montreal in 1968, both played 299 games. Kluzak retired in 1990-91 due to recurring knee problems, but his career was basically over after 1987-88, his fourth full season. His career totals of 25 goals and 123 points are the lowest of any non-goaltender taken first overall. Minnesota defenseman Kim Johnsson had had the best NHL career of any player selected last overall. Johnsson, chosen 286th in 1994, has played 598 games with the Rangers, Philadelphia Flyers and Minnesota Wild, scoring 58 goals and 243 points. He was 4-23-27 in 80 games for the Wild in 2007-08.
Who'd have thought it? — Half of the six goaltenders in the 2008 All-Star Game not only came from the same draft, but were taken in the same round — and it wasn't the first round. Boston's Tim Thomas and Florida's Tomas Vokoun, who played the last two periods for the East, and San Jose's Evgeni Nabokov, who played the second period for the West, all were taken in the ninth round. Two other goaltenders who saw significant time in the NHL this past season — Johan Hedberg and John Grahame — also were taken in that round. Thomas (Quebec), Hedberg (Philadelphia) and Nabokov (San Jose) were taken on successive picks.